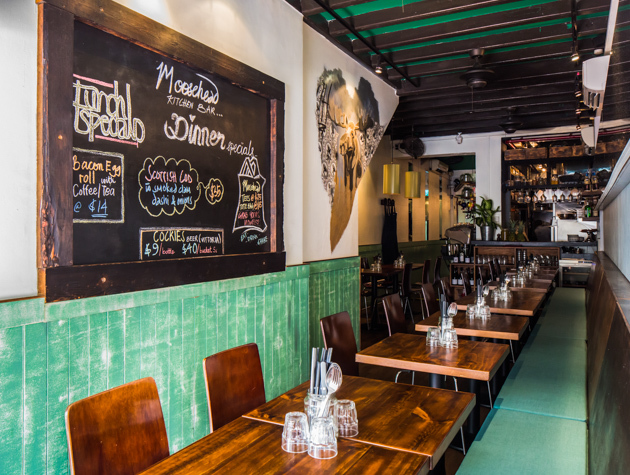 In a world that evolves, Moosehead Kitchen Bar over at Teluk Ayer Street revolves along this orbit of evolution. Cooking and churning great Mediterrano-Asian creations for the 3rd year running, Moosehead has recently appointed Chef Seumas Smith as their head chef. 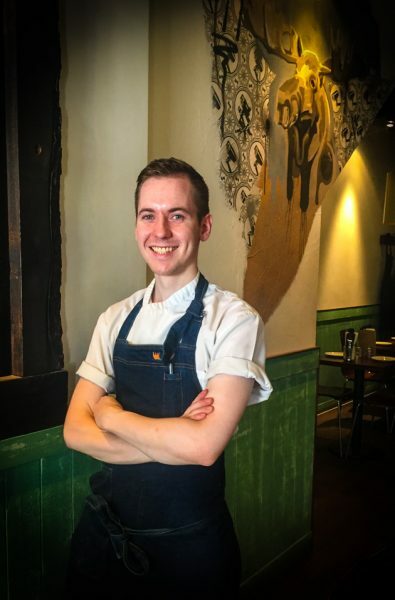 Being just a young, 24-years-old Scotsman, he has already been credited with precocious experiences in 1-Michelin starred, Lords of Manor (UK); and 2-Michelin starred Dinner by Heston (UK) and Esquina (Singapore). For those who are still reeling from the recently inauspicious BREXIT, rest assured that Moosehead’s European-Asian culinary creativity is unaffected. In fact, Chef Seumas has made several new creations of his own brand and spruced up a couple of old favourites to sooth your hunger. For their appetisers (that can also be ordered as sides to the main course), Chef Seumas’ pet creations are bound to impress. 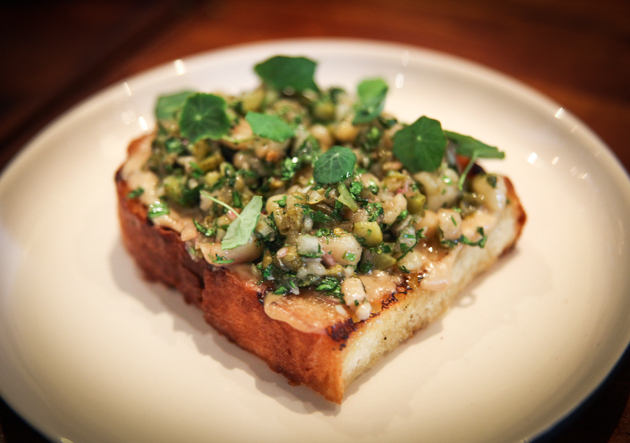 For those who are meat-inclined, try the Bone Marrow with Ortiz Anchovy with Garlic on Sourdough ($10). Ortiz anchovies are known for its smooth and tender texture, and carries a flavour that I can only describe as cheesy, Parmesan-like flavour. Combine this with bone marrow that has been charcoal-grilled with the Inka oven, this pretty-looking dish is given another dimension of acidity and herb taste with ingredients such as chopped capers, baby gherkins, pickled lemon and parsley. Thumbs up for this one – for the combination of its ingredients and toasted sourdough, this dish is definitely 3-dimensional in taste and texture. For the more health-conscious choices, there are 2 new creations that will induce profuse salivation. 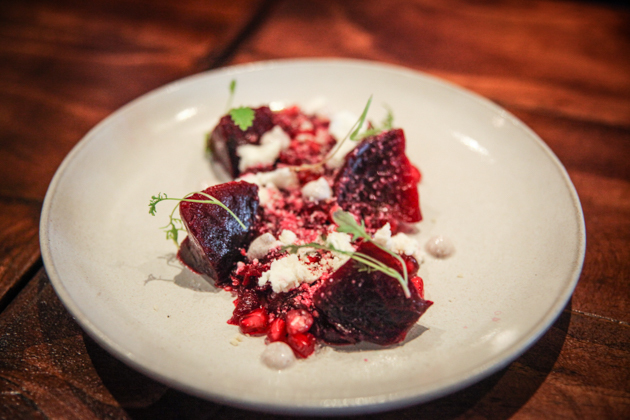 The first one is the very red Beetroot with Sumac Yoghurt, Spiced Ponzu and Almonds ($14). Again, Chef Seumas is found playing with different dimensions of tastes. The slightly bittersweet beetroot is intertwined in a spicy-sour combo, and augmented with crunchy hazel nuts. I personally would love a more spicy element in this, but the chili padi spiciness may just be enough tickle the taste buds of those who are more sensitive to chili. 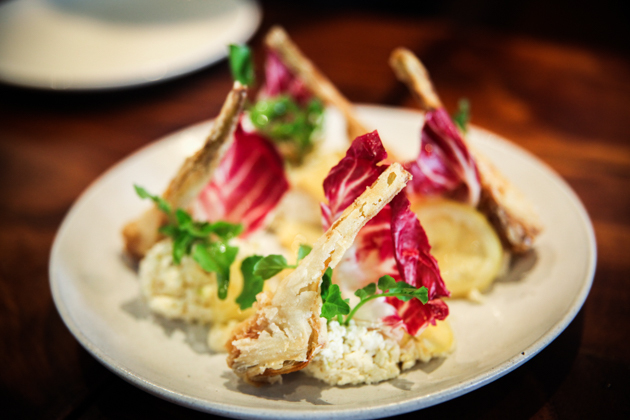 And then you have the meticulously prepared Fried Artichokes with house-made Ricotta Cheese and Pickled Lemon and Radicchio ($15). Eaten alone, the fried artichoke is crunchy and full of fragrance from its batter. However, I urge you to combine all the elements in this dish to fully appreciate what Chef Seumas intends you to palate. Crunchy-softness and savoury-sourness, are the clues to this dish. 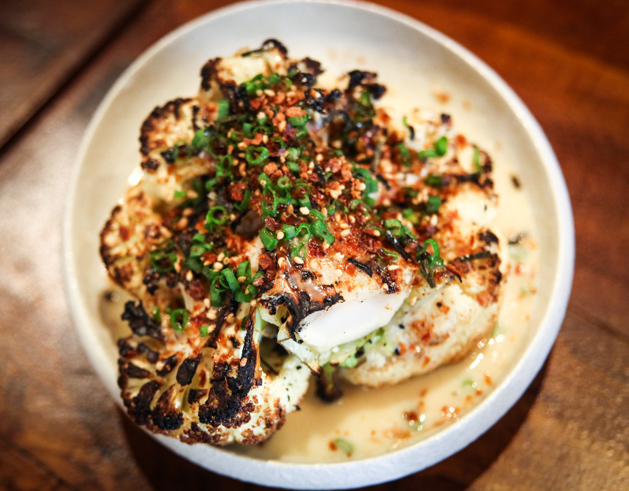 As a transition to the mains, I was introduced to my old favourite – the Inka Oven-roasted Cauliflower with Leek Confit in Créme Fraiche and Garlic Miso Dressing ($14). In this iteration, Chef Seumas has augmented it with bonito, nori, sesame seeds and lots of spring onions. This time, the oven-roasted flavour is mixed with a slightly sweeter and crunchy version. As for the main course, 2 main courses with (optional) sides are new to the Moosehead menu. The mains are must-oder items, firstly being the melt-in-your-mouth Slow-Cooked Pork Belly with Apple Roast Turnips and Cavalo Nero ($31). The cavalo nero is an Italian kale from the region of Tuscany and it has a pleasantly tangy, bitter flavour, with a sweet aftertaste. 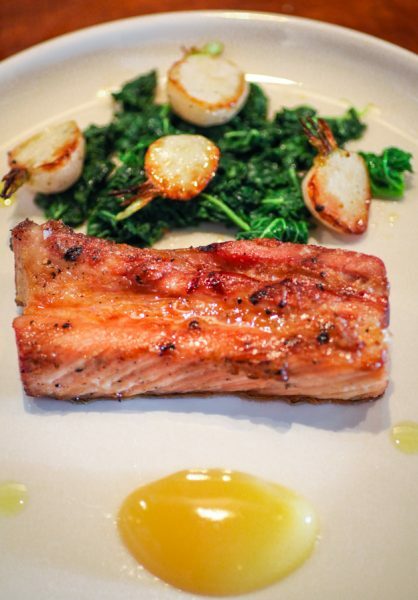 The pork belly is at its absolute tenderness, and the trick to eating this is to spread some of the apple roast turnip over a cutting of the pork, place the Cavalo Nero over it and savour the combination tastes of savoury pork, sweet apple roast turnip and the slightly bitter kale in your mouth. 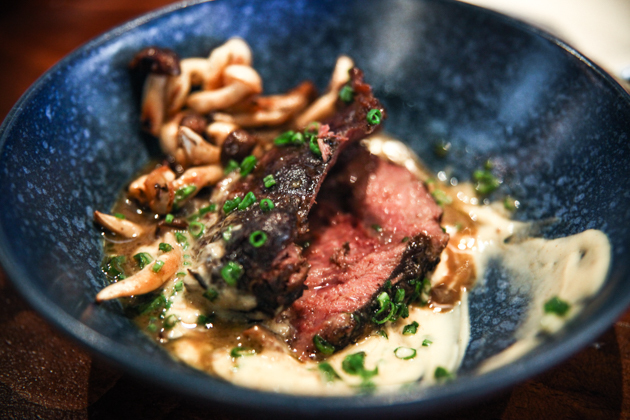 The other new main dish is the 4-hour Slow-Cooked Beef Cheek with Celeriac and Wild Mushrooms ($32). This dish is a demonstration of the labour of love that has gone into its preparation and Chef Seumas wants you to savour the combined tastes and textures of this dish. And if you wish to, you may order the sides – either the Chargrilled Broccolini with Hoisin Aioli and Roasted Peanuts ($9), or the Bone Marrow Mash Potato with Bone Marrow Reduction ($9). 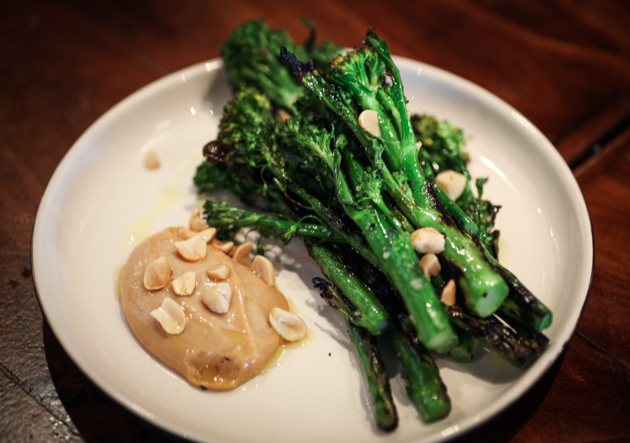 I personally liked the Chargrilled Broccolini with Hoisin Aioli and Roasted Peanuts more for its thoughtful combination of Asian influences – it is definitely my first experience at tasting the toffee-like Hoisin Aioli. The Hoisin sauce element is smoothed out enough and you could use it like a butter over the chargrilled broccolini. Think of an Asian-Caucasian mixed parentage with the best features from both worlds. 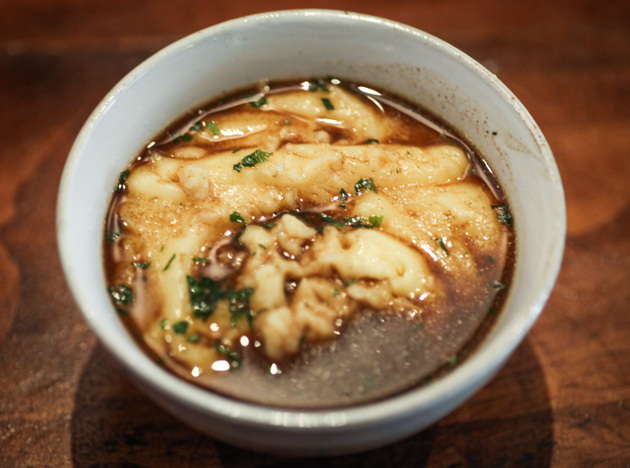 The Bone Marrow Mash Potato with Bone Marrow Reduction is a choice if you have not tried the Bone Marrow with Ortiz Anchovy earlier. It is a side dish that will complement the Slow-cooked Beef Cheek, if you have the stomach capacity for it. By the time I have reached the desserts, I was already filled. 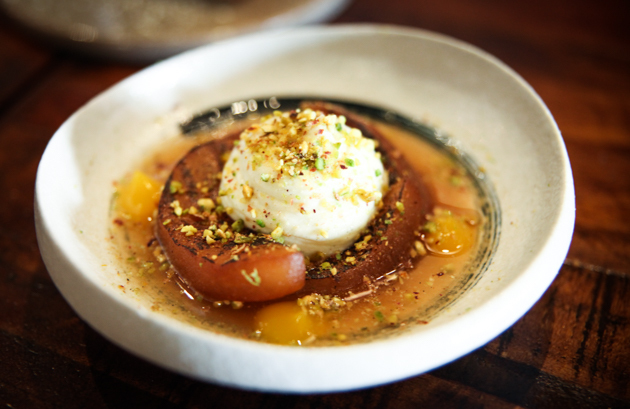 So I stood up and jiggled my tummy a bit more, so that I could fit in the Roasted White Pear with Citrus Yoghurt and Pistachio ($12). It was worth my silly antics – the roasted fragrance of the white pear paired well with the zesty citrus yoghurt. The sprinkles of pistachios were adequate to provide a crunchy dimension to the dessert. And so, Moosehead has done it again! Year after year, they churn out great creations that have never ceased to impress. Moosehead has been keeping a good following of regular diners and will surely entice new ones! To accommodate diners with more flexibility, the seating has been changed to optimise space and to cater larger group of diners – instead of high tables and chairs, a bench along the wall has been built. It is still a tight fit, but I’d say dining at Moosehead will remain close and intimate.